Managed care trends continue to have a profound effect on our daily practice of neurology. Several in particular — pay-for-performance (P4P), tiered networks, and pre-certification — have been topics of mounting concern to AAN members. While neurologists make up only 1.5 percent of U.S. physicians according to the AAN 2004 census, the conditions we treat are responsible for a disproportionately large percentage of national medical expenditures. Alzheimer disease, for example, is estimated to cost $148 billion per year, Parkinson disease $25 billion per year, stroke another $60 billion per year. None of this has escaped the attention of insurance companies, which has sharply increased scrutiny of neurology as a specialty. 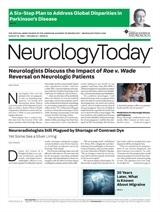 Neurology Today asked neurologists with experience in management positions at the Centers for Medicare and Medicaid Services (CMS) and two of the largest U.S. managed care organizations to offer an insider's viewpoint of today's hot issues. While each neurologist addressed a different aspect of insurance policy, all three — Saty Satya-Murti, MD; Wesley B. Wong, MD; and Robert Kropp, MD, MBA — emphasized the role of evidence-based medicine. Dr. Satya-Murti, MD, was a full-time member of the neurology faculty at Albany Medical Center in New York between 1976 and 1987 before working as a solo practitioner in rural Kansas between 1988 and 1995. While in practice, he was a neurology Carrier Advisory Committee member for Medicare and a clinical reviewer for Blue Cross Blue Shield of Kansas. He became a Medicare medical director for the same insurer in 1995, and held that position for ten years. Currently a health policy consultant and member of the AAN Medical Economics and Management Subcommittee, he weighed in on the issue most frustrating to practicing neurologists: insurance denials. Neurologists become quite irritated when procedures are denied, Dr. Satya-Murti observed. “Such denials are, in fact, more common than ones in which there are already available guidelines,” he said. “If the request is isolated and infrequent, then the provider may request a case-by-case review or an individual consideration. But such individual exceptions do not set precedent for similar dispositions in the future.” If the request or situation recurs, he said, a more concerted effort may need to be undertaken to ask for a new policy from the insurer. “Our insurers have a fuzzy understanding of neurophysiological and imaging tests and an incomplete realization of the intensity of care required for chronic neurological illnesses,” Dr. Satya-Murti said. For example, some payers consider EMG and NCS as mutually exclusive procedures, question the need for MR scans that follow CTs, and fail to appreciate the rigors of managing intractable seizures or neuromuscular disabilities. He advises neurologists to look for opportunities to communicate with payers logically, politely, and scientifically. “If we avoid exaggeration, cite science and evidence, and exercise patience, we can accomplish much,” he said. With a calm, clear, and rational approach, both message and appeal become much harder to resist, he noted. As a prelude to dealing with insurers, Dr. Satya-Murti suggests that neurologists set up a preliminary office meeting to identify key issues. Avoid hyperbole and generalizations, he advised; instead, prepare by pulling together a meticulous collection of all denial specifics, so that the appeal is packaged on the basis of available scientific evidence. “Neurologists should keep their societies informed of trends,” Dr. Satya-Murti suggested. “If the situation becomes widespread on a national scale, then individual academic societies (such as the AAN) may need to pitch in for a technology assessment and evidence appraisal,” he added. He encourages neurologists to be engaged, either individually or as an academic organization to inform the insurer and participate in policy setting. “If the issue that you are handling is large, you would be helping the payer by steering them to your academic and practice organizations,” he said. Dr. Wong, who became associate medical director at Indiana Health Care Management/Anthem Blue Cross and Blue Shield 18 months ago, said his prior administrative experience as medical director of the Neurosciences Service Line and Medical Specialties Service Line at St. Vincent Hospital in Indianapolis helped pave the way for his transition from clinician to physician executive. At St. Vincent hospital, his team assisted in quality, strategy, credentialing, development of new programs, and daily operations. In December 2004, Anthem Inc. acquired WellPoint Health Networks to form the biggest health insurance company in the U.S. At WellPoint, Dr. Wong helps oversee physician reviews, quality issues, P4P, and patient safety programs, among other responsibilities. He is board-certified in neurology, pain management, and electrodiagnostic medicine. WellPoint's medical policies are based on evidence-based medicine, said Dr. Wong. The policy on automated nerve conduction testing, for example, is based on a thorough review of the current literature, and the company's reimbursement policy for electrodiagnostic testing is based on the AANEM guidelines, which were approved by the AAN. Policies, which are available online, are developed by independent physicians, specialists, and medical directors. Dr. Wong encourages neurologists to share new evidence supporting emerging medical technologies because their policies are frequently reviewed and updated. Neurologists can and should review the policies on the WellPoint Web site, he said. Anthem does not currently have a specific P4P program for neurologists, Dr. Wong said, but the company would like to create partnerships with professional societies modeled on those it has with the American College of Cardiology (ACC) and the Society of Thoracic Surgeons. In those programs, Anthem shares claims data with the professional societies in a joint effort to develop appropriate clinical metrics. The collaboration with the ACC, for example, has resulted in an Anthem product called Quality In-Sights Hospital Incentive Program (QHIP); Anthem worked with the ACC to design a hospital pay-for performance program. The ACC created the cardiac performance measures to encourage statewide physician acceptance of the program, and to help participating hospitals collect quality data using the ACC data registry. As a result, cardiac procedural complications at QHIP hospitals decreased substantially, as compared with national data. Current measures such as LDL levels less than 100 in members with cardiovascular conditions during the measurement year, for example, result in financial rewards to selected physicians. Dr. Kropp, a double-boarded neurologist and pediatrician, worked in private practice in Atlanta for two years, seeing both adults and children, before becoming head of child neurology at All Children's Hospital in St. Petersburg, FL, where he gained ten years of clinical and administrative experience. There, he helped build programs in EMG/NCS, evoked potentials (EP), long-term EEG monitoring, intra-operative EP, and video EEG telemetry. He received an MBA from the University of South Florida, a decision spawned by the complexity of managing a growing department and lab. He is currently regional medical director for the Southeastern/Southwestern U.S. for Aetna, Inc.
Dr. Kropp agreed to speak with Neurology Today, but said that his comments reflect his personal views and not those of Aetna. One strategy for improving the care patients receive, said Dr. Kropp, is to get them actively involved in their treatment plans. He believes in “consumerism” — a viewpoint that patients can make better health care choices when they have better information and motivation. Neurology Today asked him about high performance networks — the new trend to stratify physicians by parameters set by the payers. The programs, Dr. Kropp explained, are frequently culled from information on three areas: 1) patient volume, 2) clinical effectiveness, and 3) cost efficiency. Volume is important because it assures that there is a minimal data set size to perform reasonably valid analysis, and it demonstrates that patients already have a preference for the services provided, he explained. The dilemma, explained Dr. Kropp, is that the analysis will be most representative of a physician's practice pattern by including a large number of cases, yet requiring too many cases would exclude many physicians from consideration for inclusion in the network. Cost efficiency is another parameter, which plays an important role in a provider's designation. “The cost of health care has become a major economic, social, and political concern,” Dr. Kropp said. He cited growing number of research studies that report an unsustainable rate of growth for the cost of health care and a lack of correlation between cost and clinical outcomes. Dr. Kropp, who has served on the AAN Patient Safety Subcommittee for the past two years, said that clinical effectiveness is a key component of this equation. He pointed to the large body of published literature that critically compares the care that is delivered to best practices, and reveals many opportunities for improvement. “As every member of the AAN knows, much work, consideration, and discussion has gone into defining meaningful clinical metrics for neurologists in the past year; this area will continue to evolve rapidly in the near future, and will most likely be adopted widely among government and private payers,” Dr. Kropp said. For a description of the measures that comprise the 2007 Physician Quality Reporting Initiative, see www.aan.com/globals/axon/assets/2960.pdf. More information on P4P in neurology may be found at www.aan.com/go/practice/pay. Neurology Today7(23):27-28, December 4, 2007.